Open the post for a link to the Wootton HS website. 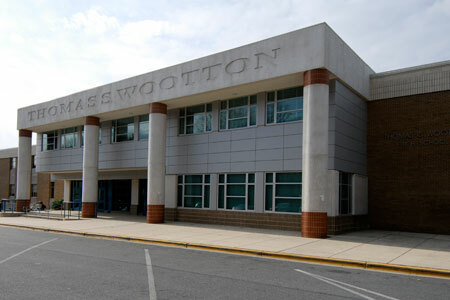 Thomas S. Wootton High School is one of the largest and best high schools in Montgomery County, Maryland. It has more than 2300 students and a staff of about 200 superb educators. It has twice been rated a Blue Ribbon School of Excellence and more recently has been consistently included among the Washington Post’s Top 100 High Schools in the US. Over 90% of its students are enrolled in Honors, AP, or some College level course. Its students consistently average higher scores on the SAT than the rest of the county, the state or the nation. 73% of our graduates score three or better on the AP tests they take. And 95% of its students go on to college. It offers a number of academically rigorous Signature and Special Programs in the Sciences and the Humanities, as well as programs for Learning and Academic Disabilities, and Life for Independence. Its students are active in all of the county approved sports and excel especially in swimming and diving, lacrosse, wrestling, and tennis. It has also been State Champions in Ice Hockey twice in the last five years. Wootton is best known for its academic rigor and quality instruction, preparing its students to become life-long learners and informed productive citizens.